For adults and kids age 8 and up. 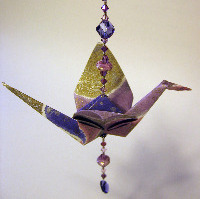 Fees include all materials and Instructor Barb's passion for helping you have fun and success with origami. We're also available for private parties and classes at your place or ours. Makes a great party, retreat, or learning activity! Have questions or a special request? Click here to contact Barb. We'll make the traditional four-point star and a second ornament that looks like a large bead. Select from beautiful papers and add glitter and beads, if you like. You might also be interested in the Beaded Ornament Class. Two pieces of paper magically lock together to form a beautiful eight-point star. Select from solids and foils. Add glitter, if you like. Learn how to laminate two pieces of regular or foiled paper to get just the look you want. 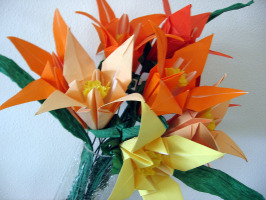 With Barb's expert guidance, learn the fundamental folds that are the basis of many popular origami models. Learn tricks for making perfect folds. 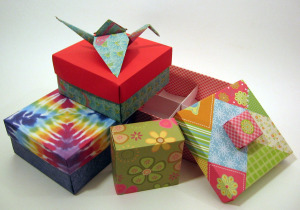 Make a basic box and a delightful flapping version of the famous origami crane. The kids are taking all of their origami things to school today. They talked about you and origami the entire ride home. "Barb is so nice!," they said. They are just thrilled with their origami things and can't wait to tell their friends and teachers about it! Learn the secrets to making a sturdy, perfect box with a snug-fitting lid and nicely finished interior. Learn to make lids that reveal a coordinating box bottom. 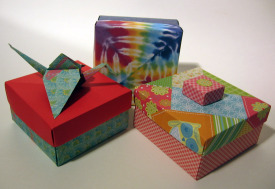 Includes making a “practice” box from plain paper before you make your beautiful box and lid. Finished box is 4x4x2¼ inches. The workshop was just great. Barb is very patient. We want her to come again. We wish we could keep her our secret! Make boxes and lids of desired sizes using easy math. Fold a paper button to give the interior a fancy finish. Make a four-part divider for any size box. 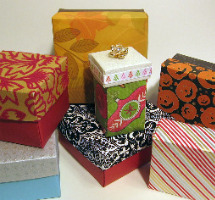 You will make two boxes: a practice box and a beautiful box from a choice of materials. This flower arrangement is one of our most popular projects. It’s both easy and beautiful. You can assemble it exactly shown here or apply your own creativity to the arrangement. This beauty is one of the oldest and most popular flowers. 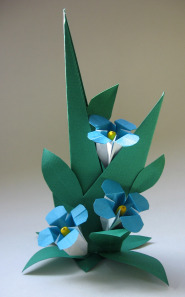 You’ll make three flowers with stems and leaves. Fee includes all materials. Prerequisite: Origami Basics or previous origami experience. This intriguing basket with handle is made from a single sheet of paper. 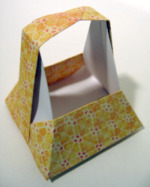 We’ll practice with plain paper and then make a large 4½x4½x5 inch basket from scrapbook paper. A fascinating project! 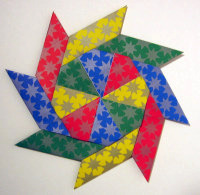 Eight easy modules assemble into an octagon and then magically transform into an 8-point star. Get completely different looks with different color and pattern choices. Fee includes all materials. Or other creepy crawlies of your choice. * Fees include all materials. Listed price is for a minimum of two participants at my Menomonee Falls studio or Hancock location. For a private lesson, double the listed price. Directions to my studio will be provided after you register. To ensure each participant receives personal attention, I prefer to keep class sizes to 4, unless there are experienced folders in the group. For groups of more than 6 participants, I provide a second instructor. Larger groups or elsewhere in Wisconsin: $250-275, depending on the project(s) selected. Fees may vary for customized classes and parties. For more information on customized events, click here. Photos are for illustration purposes only; materials used in class will be of equal or better quality, but colors and patterns may vary from that shown.